Apple just released the latest version of Safari. If you want to give it a shot you can grab a copy here. However you can still get at least one of the nifty new features: ”Reader” in your current browser. Reader lets you click a button and convert a webpage from its normal ad and picture filled self to a stripped down version with just the article you want to read. 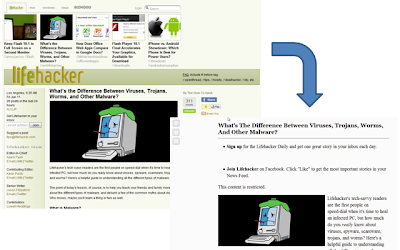 That means you can go from a busy page like lifehacker.com to a nice non-distracting page in just a click. The trick to doing this is pretty simple. Just head over to: http://lab.arc90.com/experiments/readability/ they have a created a bookmark that tells your browser just how to do this. You can customize how the bookmark will behave before adding it to your bookmarks or if want to get started right away just grab the bookmark I made by dragging this link: Readable up to your browsers bookmark toolbar. Once you have the bookmark you navigate to a page you want to read click the bookmark and enjoy your article distraction free.